One of my New Year resolutions is to continue to work on organizing my work areas. Here are 10 things that I have found have helped me immensely. Keep in mind I am still very much a work in progress, and it will be very apparent in the photos that follow! 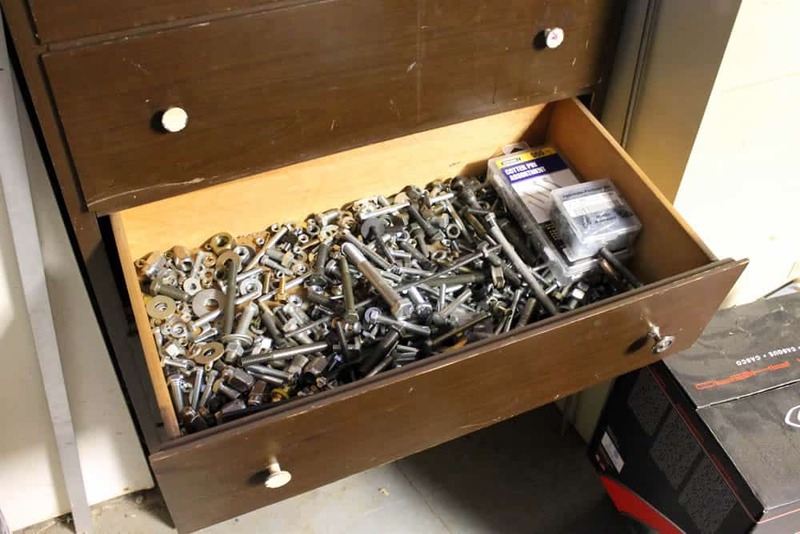 A Method for the Madness – Organize and store tools / supplies based on what they are for. Start by keeping tools that you always use together near each other. Likewise with their related supplies. For example, I keep all of my pneumatic tools together on a shelf near the compressor hose reel. And I keep a bottle of pneumatic tool oil handy there as well, so that I am more likely to remember to use it. Use this same methodology for all the various types of projects you work on. Try to form a logical location for each type of tool so you can easily remember where things are. Be consistent with where you store tools to reinforce the habit and ultimately you will spend less time hunting for tools. Shelves – I have limited space, so I took full advantage of all the wall space I could. 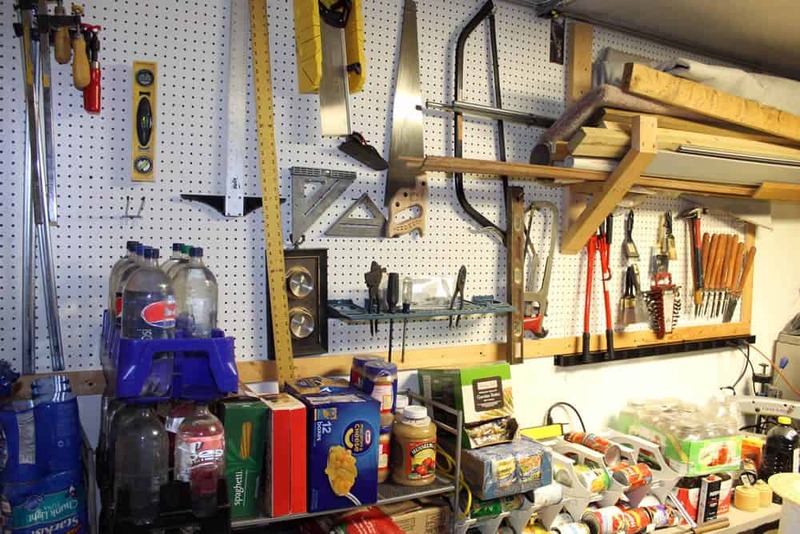 I built shelves around the perimeter of the garage and stored everything from bulk food, camping gear, tools, etc. on them. If you have a pile of stuff on the floor in a corner, imagine two shelves as doubling that same equivalent floor space, 3 tripling it, etc. Wall Storage –Balance your use of shelves with other forms of wall storage as well. Peg board can be an easy way to keep often used tools handy and easy to find. Upper Wall Mounted Lumber Rack – If you have lots of longer lumber (10-16 foot), extra carpet, PVC, flooring, etc. 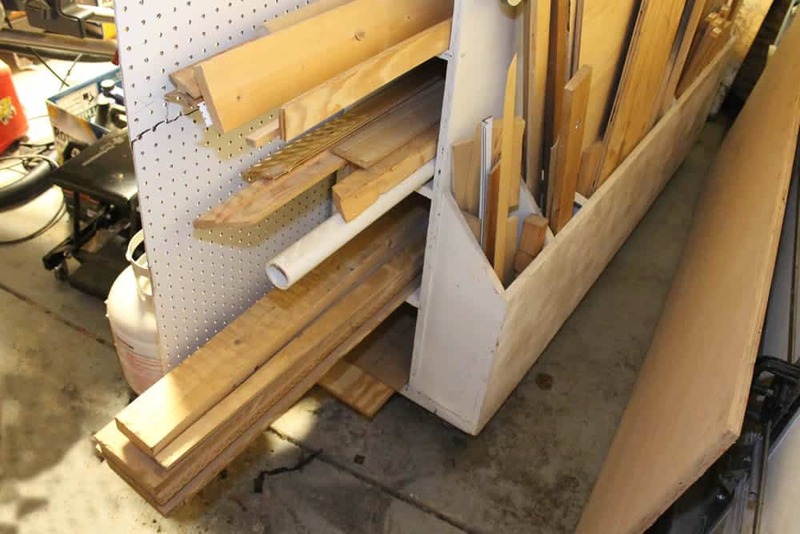 I found building some simple hooks made of 2×4 as seen in the top of this picture, spaced every 6 feet made it easy to store these types of items completely out of my way. Wall Mounted Power Strips – Space power strips mounted to the wall in areas where you tend to use power cords frequently. Especially along work benches and other areas where power is frequently needed. I have found these 5’ strips to be great for this purpose, and they are built to hold up well in shop environments. Air Hose and Electrical Cord Reels – I noticed after several years that when working on nearly any project, I would have a power cord drug across the floor to wherever I was working. And when air tools were needed the same with an air hose. When finished with something – or even worse when stopping mid-project – the last thing I felt like doing was taking the time to neatly coil the cords & hose and put it away. 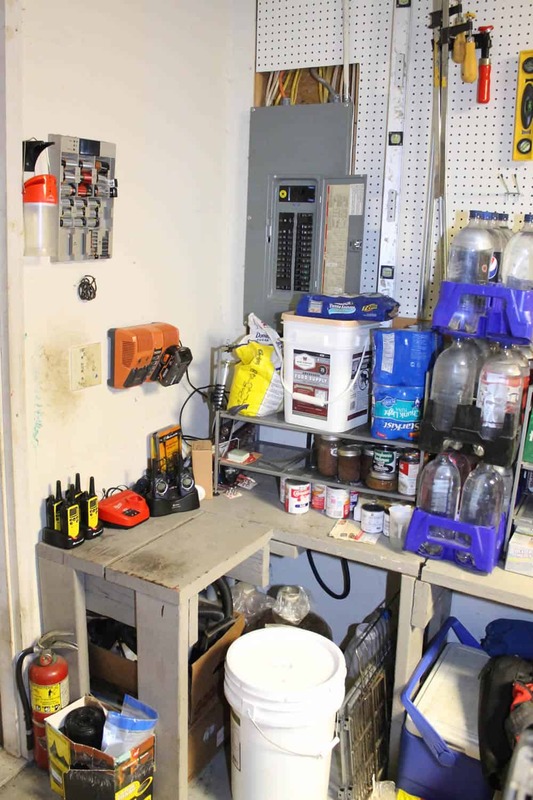 When I did – best case- it was usually a sloppily piled coil of hose on top of the air compressor, and an extension cord piled in a big jumble on the floor. More often they were just left out to trip over later. Hose reels changed that for me big time. Now cords and air hose are a snap to put away, and ultra-convenient when I need to use them quickly. A big tip I figured out was to mount them near the garage door, that way they are just as equally useful in the driveway for vehicle repairs, or vacuuming out the cars with the Shop-Vac. Wheels – If you’re like me and have more tools than space to use them, plus the need to store stuff in the same place you work, wheels are a life saver. 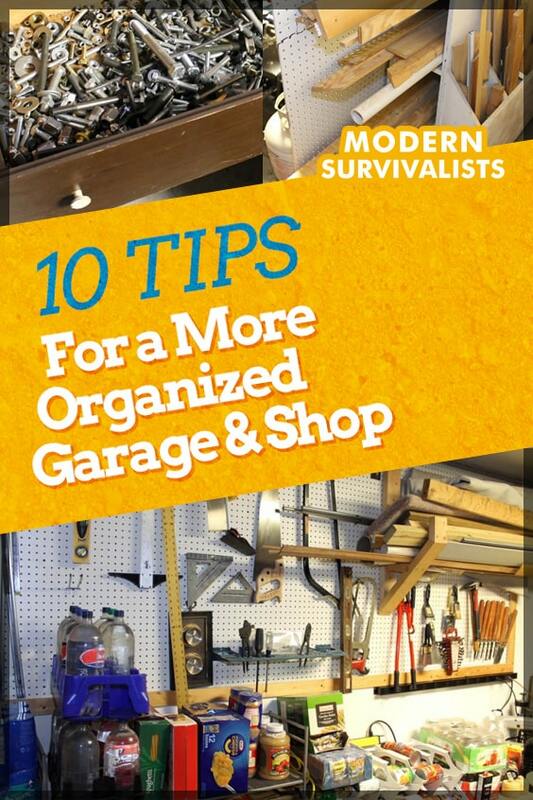 Try to keep toolboxes and larger tools on wheels so they can be shifted out of the way when you need space to work. Like when ripping a full sheet of plywood across a tablesaw. When I started to accumulate a lot of lumber from various projects, I built this lumber cart. It is 8’ long, but can easly handle 10’ lengths of lumber in the middle horizontal shelves, 8+ full sheets of plywood, drywall, and other sheet goods on the back, as well as a large selection of cut-offs in the vertical shelves on the side. Plus since it is on heavy duty casters, it is easy to move it anywhere I need out of the way. 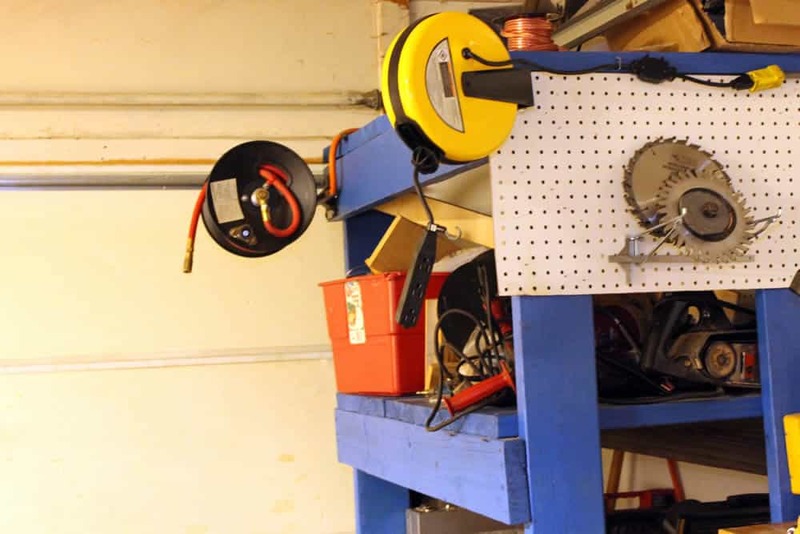 Utilize Wasted Space – Step back and look around your shop for any spots where space is not being well utilized. Find creative ways to take advantage of these nooks. I had a spot below one of my shelves that was next to a workbench and difficult to get things in and out of. I discovered my air compressor fit nicely into this spot. Since I rarely need to move my air compressor now that I have a hose reel, I located it in this nook completely out of my way. I used a switched power strip, next to my hose reel to make turning the compressor on and off a snap. 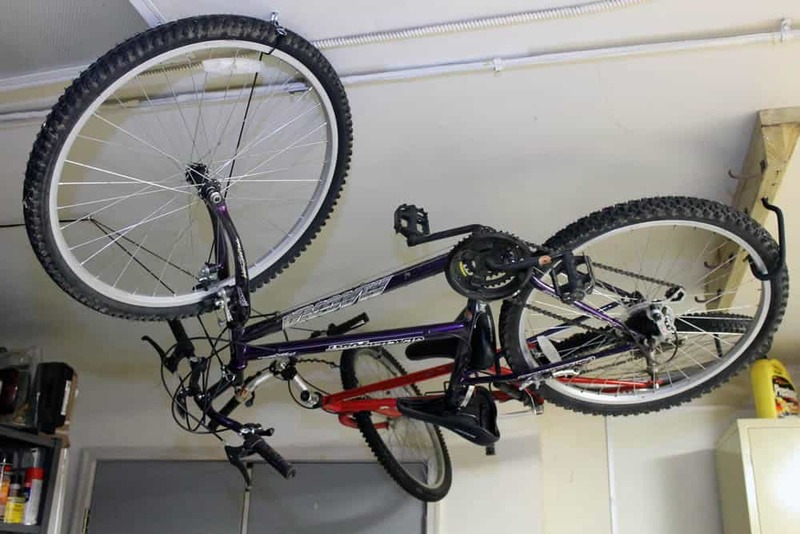 Ceiling – I found I could take seasonally used items, such as our mountain bikes, and suspend them flat against the ceiling. It was actually a fun project to work out a way to easily lower and raise them back into place with a few hooks, eye bolts, and a long length of para-cord. Please share your own ideas and tips in the comments!